He bent towards the candle and blew gently. If your soup’s too hot, blow on it. We brought in the birthday cake and watched Lisa blow out the candles. The wind was blowing snow along the street. Newspapers and plastic bags were blowing about in the wind. Everyone knows the pain of stepping on a LEGO, but it turns out the tiny building blocks also make their way into kid’s noses. Hilarious footage shows the moment a little boy asks for his dad’s help in getting a LEGO head out of the unlikely place. ‘How did he get up your nose? Did he climb up there?‘ the dad can be heard asking. 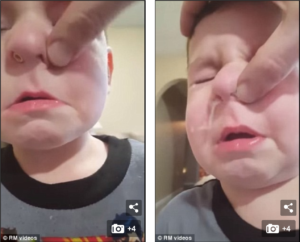 After insisting a few times that he had no idea how the toy got inside his nose, the crying boy admits he put it up there. 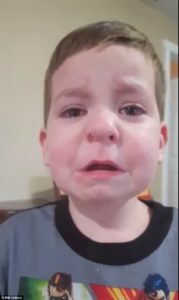 Although when asked, the boy says having the toy in his nose doesn’t hurt, he gets increasingly agitated the longer his dad takes to help him. ‘I’m going to get some tweezers,’ says the dad before the boy’s mom shows up and learns about the funny accident. She became increasingly agitated as the interview proceeded. I didn’t want to agitate her by telling her. ‘It’s not funny!’ says the boy, upset that his dad doesn’t understand the severity of his situation. Luckily, his dad found an easy solution to the problem. ‘Can you blow really hard?’ asks the dad. 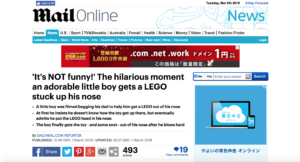 The boy then does as he’s told and blows hard, pushing the LEGO – as well as some snot – out of his nose. The severity of the storm was less than expected. Even the doctors were shocked by the severity of his injuries. I don’t think you quite understand the severity of our financial problems. You can’t imagine the severity of the heat here during the summer.